PUMA collaborated with the Crossover store, Malaysia’s premiere sneaker source, for a luscious pack dubbed ,”The Velvet Twin Pack” featuring the iconic Blaze of Glory and Disc Blaze. Aptly named 'Roses' and 'Mystery', the sneaker pack takes cues from the dark and satirical drama of films loved by Crossover founder, Jem. The Velvet Pack Blaze of Glory ‘Rose’ reinterprets the Trinomic icon with a full tonal grey treatment on mesh upper placed under nubuck and leather material with speckled cage on the overlay. The touch of pink on the tongue, lace and sole represents Crossover's signature colours while the sky blue tint adds a touch of freshness to the insole and around the tongue. An elegant rose stencil print on the heel finishes off the design. The Velvet Pack Disc Blaze 'Mystery' features a see-through Disc cap on a pitch black upper constructed of mesh, nubuck and suede. The white speckled black cage symbolizes the faint goodness that’s oftentimes found in every suspense dramas’ antagonistic character. A shot of pink on the heel tab symbolises the unpredictable behaviour of devious characters found in these type of films. 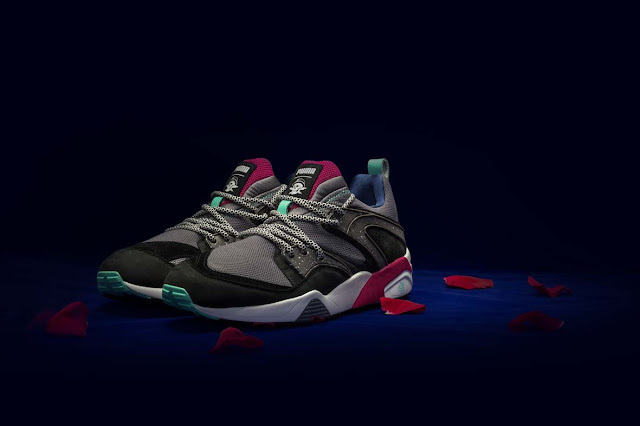 The Blaze of Glory ‘Rose’ and Disc Blaze ‘Mystery’ drops exclusively through PUMA SELECT stores in Braamfontein, Johannesburg and Bree Street, Cape Town on 23 April and 15 May for R2 499.